Note from GuitarAttack: Cool bass...some important lessons! 1. Don't get in a hurry...let the paint dry. 2. Do an inventory when the box arrives. 3. 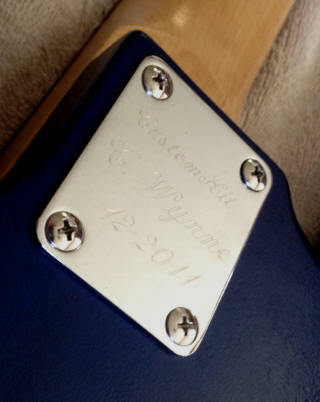 Personalize that axe...cool neck plate and decal. 4. Test paint compatibility on scrap. Got the Saga PB-10 Bass Kit for Christmas... I had done two Guitars already and was looking forward to building this one. I currently owned an Ibanez GSR200 which I liked. The first kit I got was from instrumentalley.com which got here fast. This one was front Amazon.com which uses FEDEX Home which the box was half open and all the parts were everywhere. But no problem, they were all there. 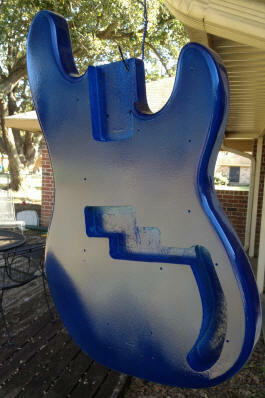 I decided to call it the "Blue Bass Project" since I had previously bought Blue "Translucent" paint from Hobby Lobby. I immediately cut the Headstock on Christmas day with a "Muddled Down" version of the current Fender Precision Bass Style. I left it somewhat big. I like basses to be "fat" if you know what I mean. Now since this is my third or fourth Kit I have a logo already made on waterslide paper and I went with "Basscaster". Sanded it and sprayed Lacquer and hung to to dry. The body was sprayed using both cans of Blue paint with many coats. I let it dry and then shot it with lacquer... Let it dry overnight. Touched it the next day and left a fingerprint in it. Darn. Sprayed it again, left overnight... next day a new fingerprint... Ugh! Decided to wait a bit and then cover it with Poly spray... left over night... ready to assemble. Assembly was easy. The Blue body looks great against the White pickguard. I have never seen a bass this color and it looks great. If you are in the sunlight, it shines and shows the woodgrain underneath. In the dark, it looks dark. 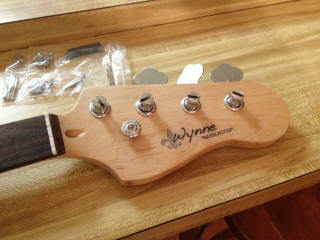 Aside from a lowering the action a bit, she plays out of the box... Just sold my Ibanez on craigslist. Great job, Collin -- Thanks for sending it in!